One of my least favorite household chores is cleaning my shower. I’m embarrassed to say I wait as long as possible, which is probably why I don’t like doing it! I need to be more vigilant about a good weekly cleaning. 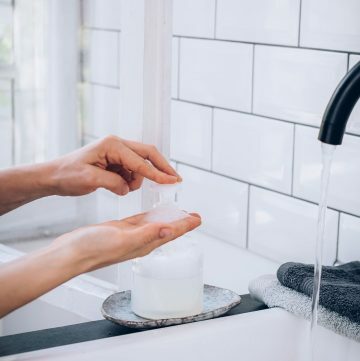 One reason I detest the chore is because we have really, really hard water and it can be very hard to scrub off all the soap scum and hard-water buildup. That coupled with not having a window in my bathroom, means my shower is more susceptible to mold and mildew. Ugh. I hate even talking about this! But you get it, right? We all have our particular cleaning nemeses and mold and mildew are mine. I stopped using bleach to clean mold and mildew last year. In our previous home, the basement bathroom could get nasty quickly. I had a mold specialist come over and check to make sure it wasn’t dangerous to our health. It was impossible to keep on top of it even with weekly cleanings. Anyway, he told me not to use bleach anymore because it only kills surface mold and causes it to come back bigger and badder than before. Now, I don’t know if that’s true or not. He recommended a really expensive antimicrobial spray. And I thought, “There has to be a better, cheaper, and more effective natural solution.” So I did a ton of research and do you know what I finally landed on? White vinegar. As plain and cheap as can be! 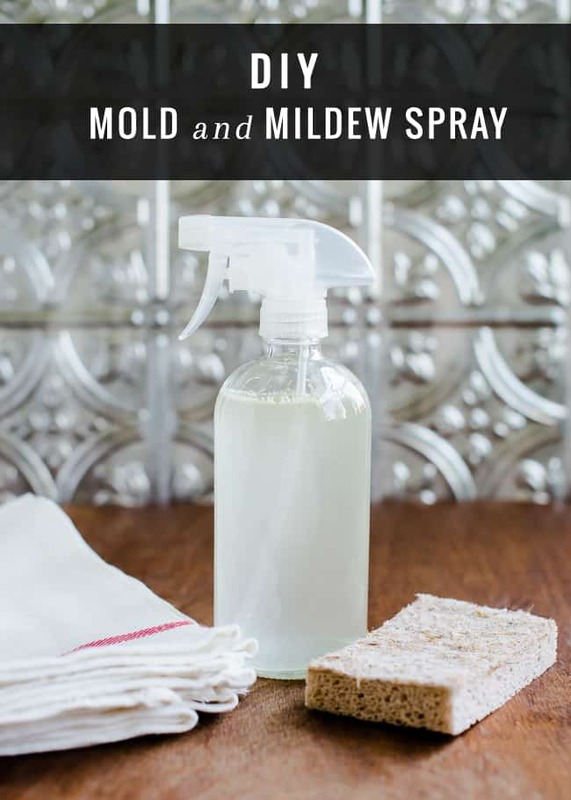 Adding tea tree oil give is an extra antifungal boost, and the orange oil to this DIY mold and mildew spray makes it smell nice. We all know oil and water don't mix. So I shake the bottle really well before I spray it. It works for cleaning and for a daily shower spray to help keep all those thing I mentioned at bay. Another great solution is a natural bleach alternative like this one. I’ve also read that equal parts denatured alcohol (like cheap vodka) and water with a little tea tree oil can also be very effective. I’ll try that one out and report back. 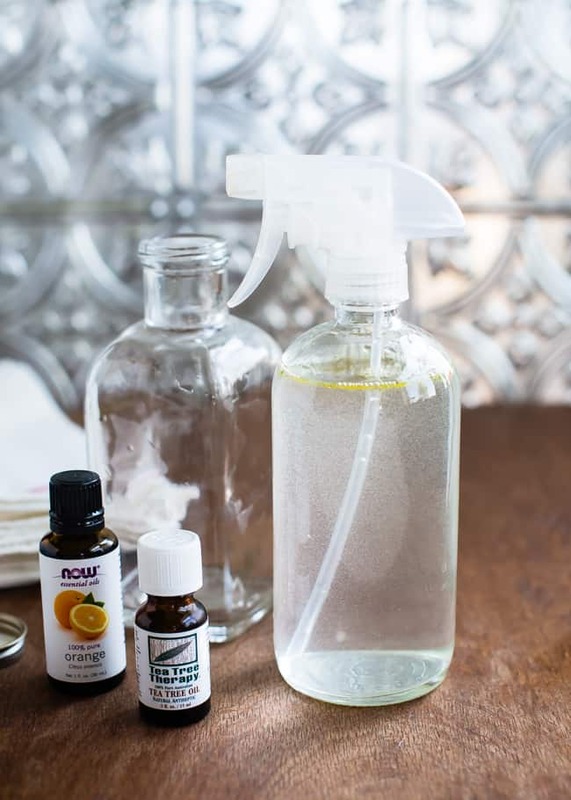 But for right now, all you do is fill up an empty spray bottle with white vinegar, add the tea tree and orange oil, shake it up, and start spraying. 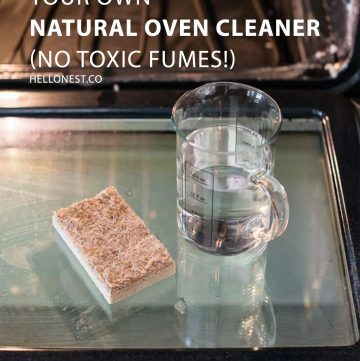 Completely non-toxic, safe and inexpensive. Three things I like the cleaners I use in my home to be. One last thing, you might need to let the vinegar sit for a while if there’s a big buildup. Love cleaning with white vinegar! 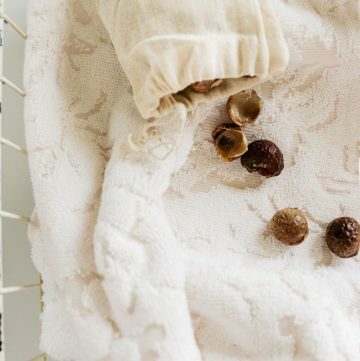 It has sooo many uses for cleaning without using harsh chemicals. Have you ever tried Doterra essential oils? They use no fillers or additives and are completely pure! This is perfect for some mold I’m dealing with now. Thanks! I have also heard that using a mouth wash such as Listerine helps to kill the bacteria if sprayed on shower walls and keeps mold and mildew at bay. Haven’t tried it myself but if it kills germs in your mouth it makes sense that it would work. I’ll have to give this one a try. 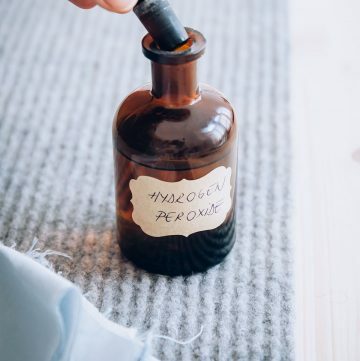 I love the fact that you chose to use the orange oil with its calming effects. Do you think one teaspoon is enough or should I add a little more for tough scrubbing mold? Thanks for sharing. Hi Elizabeth, do you mean a teaspoon of orange oil? I just use the 10 drops and it’s pretty strong. I have to have the bathroom fan running. 🙂 It works great with the smaller amount, but you could try more. Hello Elisabeth. Are you not mixing up the quantity for the tea tree oil with the quantity for the orange oil? Take a look at the recipe again. It says 1 tsp tea tree and 10 drops orange. My favorite all-time new cleanser, I use it for everything, is one part vinegar, one part rubbing alcohol, to two parts water. You can add a drop of soap as well. Stainless, granite, windows, LCD TV screens, mirrors, and laminate flooring all shine like the dickens! I’m going to add some tea tree oil for my shower now! Great idea! Well laid out blog, btw. Baking soda would help with getting buildup off the tile, but since you are using vinegar that wouldn’t work too well since the two react to each other. If there were some way to get the baking soda on the area then spray it afterwards with the vinegar solution, you would have a pretty good cleaner. Maybe a light paste of baking soda and water on the problem areas then spray it with the vinegar solution afterwards. Great recipe! For cleaning the shower doors when they get scummy use the ceramic stovetop cleaner. Brush it onto your shower doors, wait a few minutes and then it will rinse of sparkling clean with little to no effort! I love your blog, its so inspiring and fun! 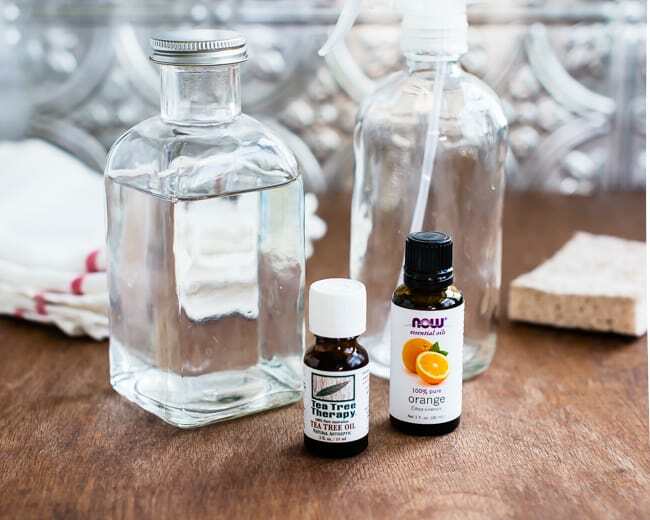 I use all natural homemade cleaners as well and found a lot of great tips on a show on hulu called Lush House. It’s an Australian show full of great green living ideas, tips and tricks. The host recommends a shower cleaner much like yours, only she also adds clove oil for its antifungal properties. I’ll have to check out that show, thanks for the tip Mariana! Just wondering do you spay this mixture after every shower and leave it? Or on a dry shower? Just want to let everyone know that new directions eo’s are wonderful. Had an opportunity to try them for the first time and they take pride and great care in what they sell. Very much impressed. Love your recipes,thank you for sharing. Going green has been the best thing for myself and my family! Tea tree oil is a natural fungicide that has antibacterial and antiseptic properties. Tea tree oil not only removes mould but will also help prevent mould from occurring. 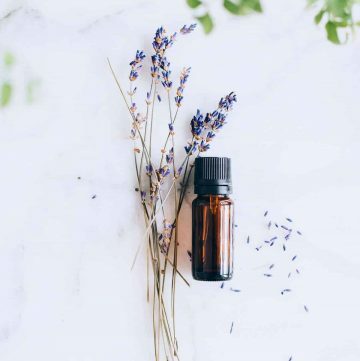 But make sure that the tea tree oil is pure, and is made from the Australian tree “melaleuca alternifolia” and has the active ingredients “terpinen 4-ol” (at least 30%) and “cineole” (no more than 10-15%). This is truly unique and excellent information. I sense you think a lot like me, or vice versa. Thank you for sharing this great article. Mold and mildew thrive in wet environments. For damp areas of the home like bathrooms and kitchens, you may want to invest in a dehumidifier. Also, be sure to fix any leaky plumbing as soon as possible to prevent mold and mildew from growing in hard-to-reach areas like behind walls and under cabinets. Make it a habit to air out your home regularly by opening windows and doors. Also, if you have ventilation fans, use them to further cycle the air in any rooms prone to excessive moisture. Keep shower curtains closed when not in use so they can dry. In my house there is a room in the attic that an old owner made and its molding like crazy. Some areas are 2-3 inches thick!!! This is very helpful. Would it be safe to use your Mold and Mildew recipe on plant that have developed a mold like substance on the plants soil? Can you use this mixture on honeycomb room darkening shades. They have some mold on side of window. I have tried different cloth cleaners that did not work and stained the shades. Do you have any solution to try. They can not be rinsed off.